Now I know that I sound angry by typing in all caps, but I’m really trying to drive home this point: Too many sourcers and recruiters are afraid to pick up the phone and instead only do what is called “email recruiting”. The problem with that method is that it’s difficult to get an honest (or close to honest) read of the candidate. We live in a world where people can hide. They hide behind emails, they hide behind social profiles, they hide behind comments on websites. This technological separation between people allows them a certain level of protection and feeling of bravery. The downside is that the candidate’s answers are not spontaneous, they are edited many times over, and sometimes they are not even their own answers! I’ve Found the Candidates, Now What? In the last post, we looked at all kinds of ways to source a req. Now that you have your potential candidates, you have to contact them, figure out their motivation for working, and see if they are a good fit for the company. Easy, right? Well…yes, it is. You’ve done the work to find the candidates, you might as well continue that research-oriented mindset when you screen the candidates on the phone. Recruiting is an art form and there are many ways to achieve results. “Track record in power/energy and civil infrastructure projects. 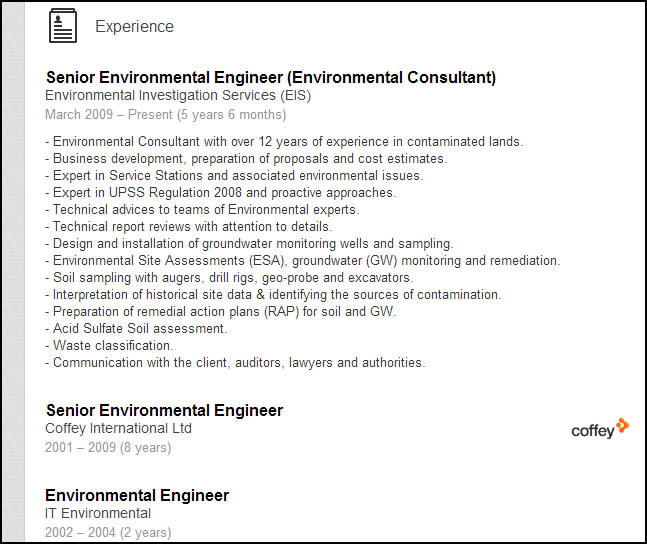 Senior Environmental Engineer with heavy civil engineering experience. This is your typical perm profile for a candidate. If this candidate even considers a move to a different company for a perm job, it had better align with their wants, needs, and motivation for working. The phone call or screen should be focused on 2 things: does this candidate really do what they say they do? And what are their motivations for working? Everything else is just gravy. Even though it’s quite easy and very tempting to blast this email message out to every candidate and hope for the best, I wouldn’t do it. It’s the constant onslaught of impersonal messages from recruiters and sourcers that give our industry a bad name. There are many more ways this can be done, but the moral of the story is that the more you know about your candidate, the easier it will be to connect with them. The company they work for – culture, bosses, team, etc. Upward mobility – is there room for growth? After listening to the candidate’s reasons for working, you had better have a job that matches multiple motivating factors that concern the candidate. If the money is not more than what they make, then every other factor should be met and exceeded. Maybe the company that you are recruiting for has some innovative technology or services that the candidate always wanted to be a part of. Maybe for the candidate it’s a combination of a closer location to home and a more laid back company environment. Whatever the reasons are, it’s just part of the dance between the recruiter and the candidate.